Examine a curve defined parametrically. 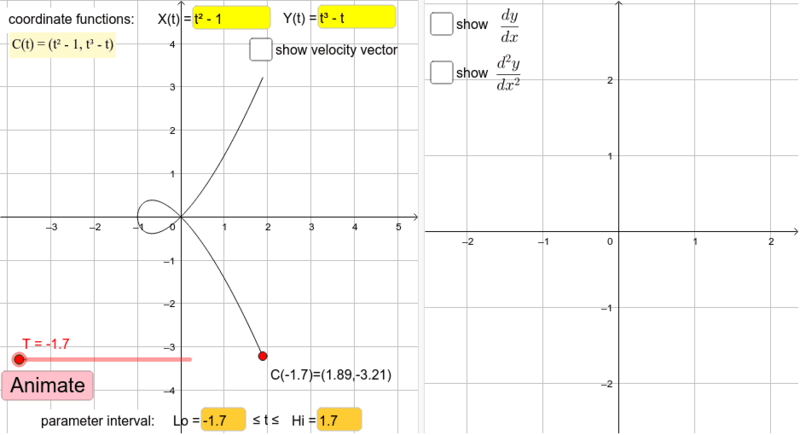 Left panel shows curve; right panel can show first & second derivatives of y with respect to x. Enter coordinate functions for C(t)=(X(t),Y(t)) at top of left panel [use variable t]. Enter ends of parameter interval [Lo,Hi] at bottom of left panel. A slider specifies number T for point C(T) to be marked on the curve; animation shows how that point moves as T increases from Lo to Hi. (To change T by 0.01, click-on T and use left- or right-arrow key.) A checkbox in left panel gives an option for the velocity vector at C(T) to be displayed. Checkboxes in right panel give options to display slope and concavity info for the curve.